Children who start fires may be children in crisis, with the fires acting as cries for help from stressful life experiences or abuse, according to studies of fire-setting behavior. Source: NFPA's "Children Playing with Fire" report by John R. Hall, Jr., April 2005. Never use lighters or matches as a source of amusement for children; they may imitate you. It's a beautiful day — the sun is shining, the birds are chirping. What could be more perfect than a bike ride? But wait! Before you pull your bike out of the garage, let's find out how to stay safe on two wheels. Why Is Bicycle Safety So Important? Bike riding is a lot of fun, but accidents happen. Every year, about 300,000 kids go to the emergency department because of bike injuries. Some of these injuries are so serious that children die, usually from head injuries. A head injury can mean brain injury. That's why it's so important to wear your bike helmet. Wearing one doesn't mean you can be reckless, but a helmet will provide some protection for your head and brain in case you fall down. Bike helmets are so important that the U.S. government has created safety standards for them. Your helmet should have a sticker that says it meets standards set by the Consumer Product Safety Commission (CPSC). If your helmet doesn't have a CPSC sticker, ask your mom or dad to get you one that does. 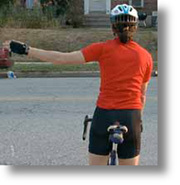 Always wear a bike helmet, even if you are going for a short ride. Your bike helmet should fit you properly. You don't want it too small or too big. Never wear a hat under your bike helmet. If you're unsure if your helmet fits you well, ask someone at a bike store. Once you have the right helmet, you need to wear it the right way so it will protect you. It should be worn level and cover your forehead. Don't tip it back so your forehead is showing. The straps should always be fastened. If the straps are flying, it's likely to fall off your head when you need it most. Make sure the straps are adjusted so they're snug enough that you can't pull or twist the helmet around on your head. Take care of your bike helmet and don't throw it around. That could damage the helmet and it won't protect you as well when you really need it. If you do fall down and put your helmet to the test, be sure to get a new one. They don't work as well after a major crash. Many bike helmets today are lightweight and come in cool colors. If you don't love yours as it is, personalize it with some of your favorite stickers. Reflective stickers are a great choice because they look cool and make you more visible to people driving cars. Riding a bike that is the right size for you also help keeps you safe. 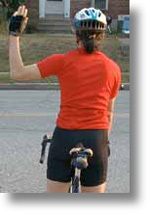 When you are on your bicycle, stand straddling the top bar of your bike so that both feet are flat on the ground. There should be 1 to 3 inches (2.5 to 7.6 centimeters) of space between you and the top bar. Make sure your seat, handlebars, and wheels fit tightly. Check and oil your chain regularly. Check your brakes to be sure they work well and aren't sticking. Check your tires to make sure they have enough air and the right amount of tire pressure. Wearing bright clothes and putting reflectors on your bike also can help you stay safe. It helps other people on the road see you. And if they see you, that means they're less likely to run into you. You'll also want to make sure that nothing will get caught in your bike chain, such as loose pant legs, backpack straps, or shoelaces. Wear the right shoes — sneakers — when you bike. Sandals, flip-flops, shoes with heels, and cleats won't help you grip the pedals. And never go riding barefoot! Riding gloves may help you grip the handlebars — and make you look like a professional! But avoid wearing headphones because the music can distract you from noises around you, such as a car blowing its horn so you can get out of the way. You need to check with your mom and dad about where you're allowed to ride your bike. You need to know how far you're allowed to go and whether you should ride on the sidewalk on in the street. Kids younger than 10 years should ride on the sidewalk and avoid the street. No matter where you ride, you need to keep an eye out for cars and trucks. Even if you're just riding on sidewalk, a car may pull out of its driveway into the path of your bike. If you're crossing a busy road, it's best to walk your bike across the street. A bike path free of cars is a great choice if there's one in your area. Just remember to share the path with the other riders, walkers, and strollers who also might be using it! And if you're going on a long ride, bring some water along with you. little kids in your way! Always ride with your hands on the handlebars. Always stop and check for traffic in both directions when leaving your driveway, an alley, or a curb. Cross at intersections. When you pull out between parked cars, drivers can't see you coming. Walk your bike across busy intersections using the crosswalk and following traffic signals. Use bike lanes or designated bike routes wherever you can. Don't ride too close to parked cars. Doors can open suddenly. Stop at all stop signs and obey street (red) lights just as cars do. Ride single file on the street with friends. 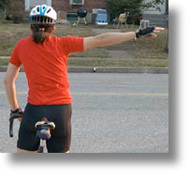 When passing other bikers or people on the street, always pass to their left side, and call out "On your left!" so they know that you are coming. It will also help to learn some hand signals. These are like turn signals and brake lights for bikers. It helps cars and trucks know what you will do next, so they don't run into you. 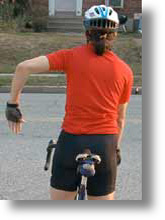 Now that you've learned those hand signals, we'd like to give you a big thumbs-up for finding out more about bike safety!